These are probably the most memorable words from a song that I listened to during my college days. The Anime "Beck: Mongolian Chop Squad" is an amazing anime with equally amazing music. It is full of so many catchy tunes that really make you excited to hear the next new track. I think that one of my favorites so far is "Follow Me", which in the anime is said to have been originally sung by The Rocket Boys. I cant seem to find anything one them so I'm not too sure if this is just a fictional group for the anime. Either way, it is a good song. On the other hand, there is a lot of mention of real musical acts like The Red Hot Chilli Peppers, The Rolling Stones, and many more. I'm about halfway through the series after buying it two days ago. I bought the entire series recently at FYE. I saw it sitting there on the shelf and thought, "Heck. Why not". The rest is history. As soon as I got this baby home, I unwrapped it and dove right in to a world filled with guitar chords, Dying Breed, a dorky kid that wants to learn music, and a creepy old guy that hangs out at the local pool while trying to force swimming lessons on innocent swimmers. Sounds like the making of something great, right? You are correct here! 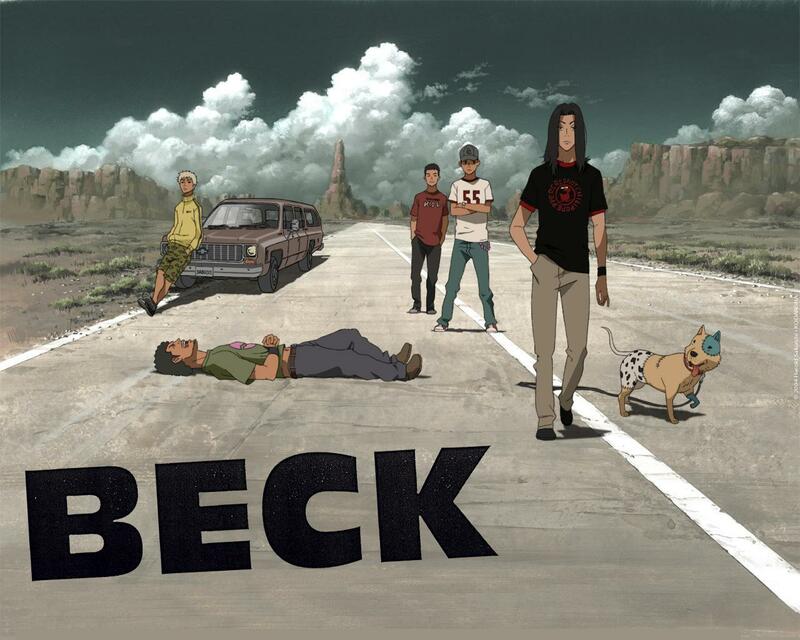 Beck may seem pretty rock heavy on the surface, but it really gets deep as it follows the life of Koyuki. This kid has a lot of heart. Honestly, I often wondered how the heck this kid has time to do and learn so much. I mean seriously! For the sake of not spoiling the show, this kid gets roped into whatever endeavour presents itself to him. FYI, I may be exaggerating here. Not only does that happen, but he tackles these things wholeheartedly and strives for perfection. Yikes kid! I tip my hat to you. I really enjoy seeing character progression and Beck does not disappoint. Seeing the humble beginnings of this series shows Koyuki as just a wide eyed kid with an infatuation with learning to play guitar after meeting Ryusuke. Can't blame him; the guy is pretty cool when looking through the eyes of a 14 year old. Yes, it was stated in the anime that Koyuki is 14! Like I said, he does a lot for a kid. Seeing him progress and mature through the situations that he finds himself in throughout what I've seen in this anime has made this purchase worth it. I'm glad that I bought this as I find Koyuki easy to relate to. I'm looking forward to finishing this series. At this rate....it will be a few days from now.